Everyone loves a piece of lore, but guitar culture in particular pines for a legend. Famous guitars are every bit as revered as the players who own them, and the stories behind some instruments are told time and time again, creating a modern mythology. 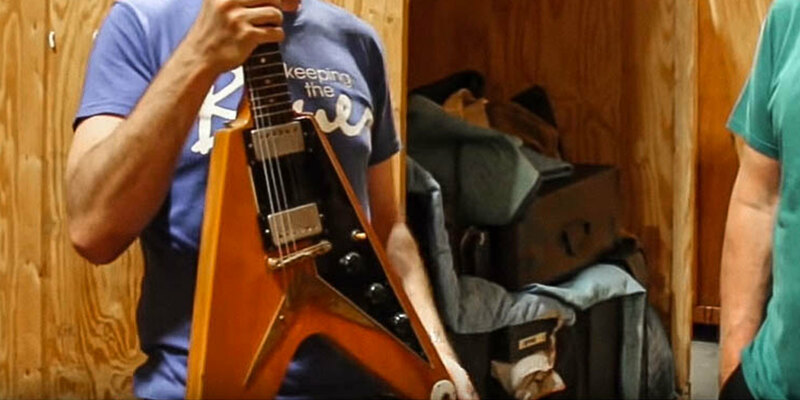 Such is the case with an original 1958 Gibson Korina Flying V, recently purchased by Joe Bonamassa for his Three Kings tour, which honors blues legends Freddie King, B.B. King and Albert King, who favored the Flying V.
One of the Great White Whales of the guitar world, the original run of Korina Flying Vs hold a mythic place among collectors. Considered a dud at the time because players were put off by the modern, iconoclastic design, only 98 are documented from the original factory run, and only ten of those sport the black pickguard found on this specimen. Currently valued by the “Blue Book of Guitar Values” at between $200,000 and $300,000, these once neglected beasts are now the crown jewel of any rare guitar collection. Of course, such an incredible instrument has an equally incredible backstory. Bonamassa christened the guitar “Amos” after Amos Arthur, who founded Arthur’s Music Store, a quintessential family-owned American guitar shop, in 1952 in Indianapolis, Indiana. Literally generations of players have passed through the shop since it opened. 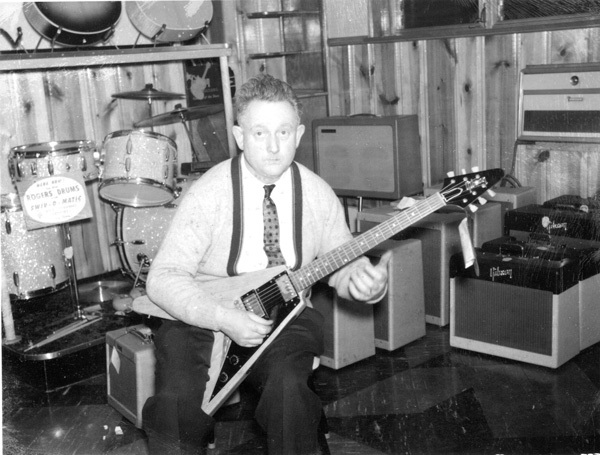 At a time when big bands and archtops were the order of the day, and names like “Stratocaster” and “Les Paul” were foreign to most, Arthur recognized the power of rock ‘n’ roll and stocked his store with the newest guitars, basses and amps he could find to suit a new generation of players with contemporary tastes. 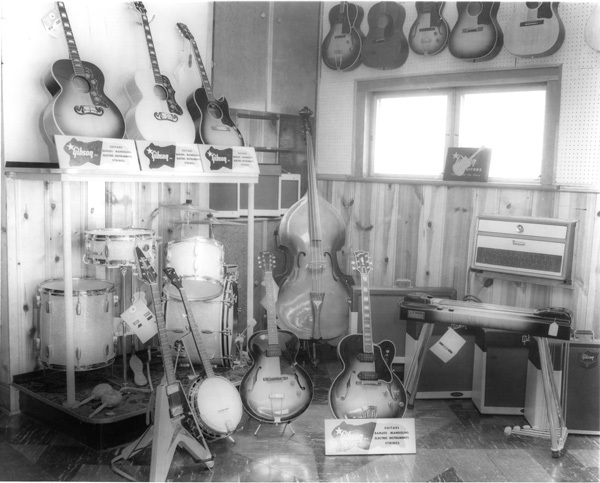 “He asked a lot of questions of [Gibson’s] people until finally Wilbur Marker, who was their national sales manager at the time, would end up bringing information to my father and asking ‘What do you think of this design?’” says Linda Osborne, Arthur’s daughter who now owns and operates the store with her daughter Amy England. “Dad did help redesign the new Gibson banjos, the RB250s, when they remodeled those. Because he had a lot of information about the instruments and was a knowledgeable player, they’d ask his opinion on those things.” Arthur’s relationship with Gibson and his keen eye for new designs led to his stocking the Flying V in 1958. Sleek, futuristic and pointy, the V defied all guitar conventions of the ‘50s and set Arthur apart as a businessman and musician on the vanguard. Arthur’s proclivity for the bold didn’t stop with his choice of guitars. He and his staff had a flair for generating publicity, which led to one of the best photos of the Flying V. Popular in the ‘50s, “pole sitting” was a publicity stunt frequently employed by radio stations. And in 1959, a 17-year-old girl named Mauri Rose Kirby spent 211 days in a tiny shack 40 feet up on a telephone pole down the street from Arthur’s. While the spectacle would draw attention, sitting by yourself 40 feet in the air actually could be pretty dull. 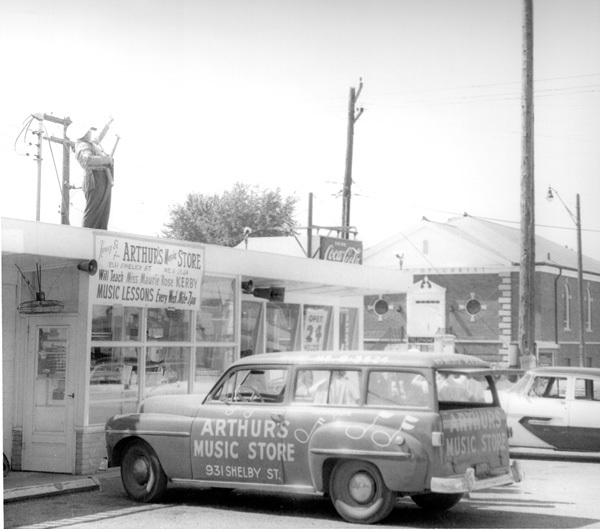 To help Kirby pass the time, and draw some publicity to Arthur’s, Kenny Si, one of the shop’s salesmen at the time, would go on the roof with a guitar and teach Kirby, who had a little acoustic up in her perch, how to play. One day, he decided the Flying V would make an impression during their rooftop jam sessions. Unfortunately, a fog covers the 17 years between 1959, when the V was sold, and 1975 when it resurfaced. Arthur’s didn’t begin recording serial numbers on sales receipts until 1962, and the hands this guitar passed through remain unknown. Fortunately, our story resumes with Norman Harris, owner of Norman’s Rare Guitars and one of the most respected authorities on vintage guitars. Under Harris’ watch for 40 years, Amos was well cared for and preserved, but that doesn’t mean it was out of the spotlight. Remember the Flying V in “This is Spinal Tap”? None other than Amos. And while most would imagine a seasoned guitar tech was the one picking out the axes for the film, Christopher Guest, who played the role of guitarist Nigel Tufnel in the movie, was the one ensuring the band that played at 11 would have the best gear. A family legacy, a movie appearance, a famous blues guitarist; the story behind this 1958 Gibson Flying V has all the makings of a legendary guitar.